Explore an understudied but vital aspect of the immigration experience! Until now, the American social work literature on immigration has emphasized one part of the migration process—the experiences of immigrants in this country. Country-of-origin experiences that lead to emigration have received limited attention. Immigrants and Social Work: Thinking Beyond the Borders of the United States expands the focus of the literature, drawing clear connections between immigrants’ situations in their countries of origin and how they adapt to their new country. This book presents a two (or more)country perspective on immigration, looking at migration as a process that requires an understanding of phenomena that occur in immigrants’ country of origin and that impact their lives in the United States. It also looks at immigrants’ back-and-forth movements between their home and new countries, and examines the immigration process when it involves movement to a third or fourth country—or, as in the case of the Armenian diaspora, a return to the home country after years of settlement in a new land. 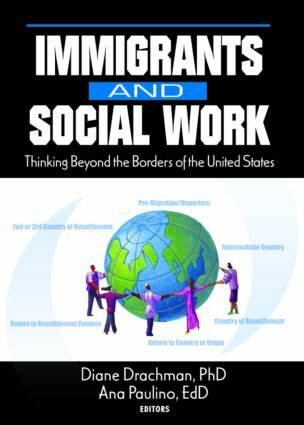 Immigrants and Social Work: Thinking Beyond the Borders of the United States is important reading for social work professionals who serve immigrant populations. It is also an ideal ancillary text for courses in international social work, family policy, social work with immigrants and refugees, child welfare, and social work practice with families, as well as any social work course that covers Chinese, Mexican, Armenian, Puerto Rican, or Dominican immigrant populations. Make it a part of your teaching/professional collection today.